Done the usual thing.....trace the outline from the manga page....and then colored it. Then i'm kinda stuck at the background. Didn't wanna go for scenic simply because it's too much work. i looked at my old Loveless wall...and then started messing around with the bg. For some reason i thought, it's just too plain...simply having an abstract/texture color background doesn't really quite work. This is what i call flawless vectoring. The outlines are just the right thickness and the overall vector work is fabulous. What I have always liked about your bg is the vector-style that is simple, yet highly fitting to the vectored img. Proposed by euna and highlighted by shyxsakura. OMG! 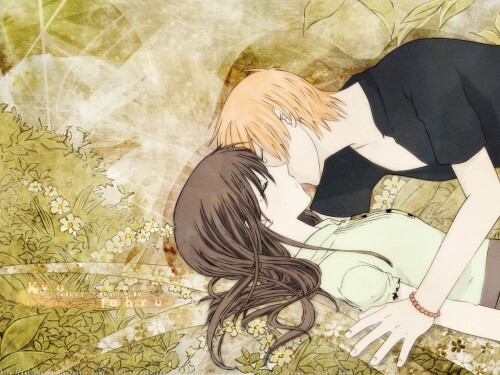 Tohru and Kyo are so cute >_< I don't think I remember this part but it's so romantic :) My fav! Oh this is really sweet and cute! Nice background and coloring! YAY! Kyo & Tohru! I love it! The background is awesome! Ok about the wall. I really like the coloring of the scan and the texture you put at some place. The flowers part is a great idea, it fits well I think and I like the abstract lines that pass in front of them in semi transparency. Again, colors in the background overall are really nice. I like when everything seems to be in a same teint. I a bit less like the writings that I found a bit confusing on the flowers... maybe I would like it better on the upper part and it would also add something where it's a bit more empty. Overall a really harmonious wallpaper. waah! cool looky grunge style bg! i really feel sorry for yuki that he seem that he can't do that to toruh but oh well! great job! +fav! woa ayaki did awesome work >__<, i always admire your work, this one is wonderful, the best fruit basket wall i've seen. very very beautiful work >___<. Yes ! Finally a kiss in Furuba ! Tohru + Kyoun are one of the cutest couples ever ! Thanx! Great wallpapers, nice colors ! *Dies* This is too awesome. Love the bg and the colors are wonderful! Nicely done with the tracing and colorig too! you are fantastic .. love all in the wallpaper work. colors, used scans, vector work, topic :) great like always. this is real cute! really like what you've done here. where did u find the other chapters tho? i got up to 107 so far. This is just so beautiful. The background colours are just perfect and the pair just fit perfectly with the entire background. It gives a feeling of softness and happiness. Great work! Its so cute and clean :o Really nice work Ayaki! The vector is so well done too! I love this wallpaper. The soft and compelling colors and texture are just gorgeous.